In recent months, there has been increasing talk about restructuring the Supreme Court. Ideas previously confined to the fringes of political and academic debate have gone mainstream. Demands to rethink the way the Court operates have become particularly prominent among those on the political left who have been scarred by a series of recent setbacks: the Republican refusal to hold hearings on Merrick Garland during Barack Obama’s last year in office, culminating in the appointment of the reliably conservative Neil Gorsuch to the vacant seat; last Term’s string of highly consequential conservative 5-4 rulings; and, most recently, the Republican victory in placing Brett Kavanaugh on the Court after a spectacularly controversial and partisan confirmation process. With the conservatives basically running the table over the past couple years when it comes to the Supreme Court, liberal activists, politicians, and commentators have been urging an array of Court reforms. In a series called “Rethinking the Supreme Court,” ISCOTUS will explore some of these proposals. In this post, we’ll look at term limits for Supreme Court justices. The idea of abandoning life tenure for Supreme Court justices in favor of fixed terms is not particularly new. In the early 1980s, John Roberts, then a lawyer in the White House counsel’s office during the Reagan administration, expressed support for term limits. In 2006, law professors Steven Calabresi and James Lindgren wrote a lengthy law review article advocating this reform. But in recent years the idea seems to have gained strength. The most common proposal is for fixed 18-year terms for justices, staggered so that each President gets two appointments per four-year term. The biggest challenge for this reform: most assume it would require a constitutional amendment, and it’s hard to envision getting the super-majority support required to make this happen. Yet recent polls show that a solid majority of Americans support term limits for Supreme Court justices, suggesting the possibility of a viable amendment campaign. The leading advocate for term limits for Supreme Court justices today is a judicial reform organization called Fix the Court. Rather than a constitutional amendment, this group is pushing a proposal for term limits by congressional statute,. The proposal, called the Regularization of Supreme Court Appointments Act, aims to “depoliticize and regularize the U.S. Supreme Court confirmation process.” The plan would allow the presidents to nominate a justice in the first and third year of each of their terms, which would eliminate the “randomness” of the confirmation process. To get around the constitutional requirement that federal judges “hold their Offices during good Behaviour”—i.e., judicial lifetime tenure—Fix the Court’s proposal requires that when a new justice is appointed to the Court, the longest serving justice moves to the status of “Senior Justice.” A Senior Justice would no longer be a regular member of the Court. Rather, this justice would have a more limited role, serving on cases where there’s a conflict of interest for another judge; breaking ties on the most controversial cases; fulfilling vacancies that arise because a justice dies, retires, or is removed; and serving on lower federal courts. According to Gabe Roth, Fix the Court’s executive director, the proposal “lower[s] the stakes in a way that would make each nomination seem less like partisan Armageddon.” He argues that such a reform would allow for the appointment of justices who are older, more experienced, and less ideological. This post was written by ISCOTUS Fellow Michael Halpin, Chicago-Kent Class of 2020, and edited by ISCOTUS Editorial Coordinator Matthew Webber, Chicago-Kent Class of 2019, and ISCOTUS Co-Director and Chicago-Kent Faculty Member Christopher W. Schmidt. As many observers of the legal drama surrounding President Trump have noted, under current Supreme Court precedent, a state can prosecute someone for a crime after the federal government has already done so — or vice versa. Recently, the Supreme Court heard oral argument in the case of Gamble v. United States, which raises the issue of whether to reverse that longstanding doctrine, known as the “separate sovereigns” exception to the Double Jeopardy Clause. (The Clause guarantees that no one shall “be twice put in jeopardy” “for the same offence,” which generally means that a person cannot be tried twice for the same crime. In 2015, police pulled over Terance Gamble for a faulty headlight. After the police officer smelled marijuana and searched the car, he found a handgun. Both the state of Alabama and the federal government also charged Gamble with possession of a firearm as a felon, and he was convicted in state court. Gamble then argued that the federal court should dismiss the charge against him under the Double Jeopardy Clause. The trial court rejected his argument, relying on the separate sovereigns doctrine, and the Eleventh Circuit affirmed. In oral argument on December 6, Gamble’s attorney argued that the separate sovereigns exception to the Clause is inconsistent with the Clause’s text and original meaning. He pointed out that the Clause’s drafters intended the text to incorporate English practice, and there was no practice of inter-sovereign successive prosecutions in English history. Justice Alito expressed concern about the ramifications Gamble’s argument would have for national security. The Justice posed a hypothetical in which terrorists kill American tourists in a foreign country and an inept prosecution yields an acquittal or light sentence. The Justice asked whether Gamble’s position would be that no prosecution could take place in the United States under the statute Congress enacted to permit prosecution of individuals who murder Americans abroad. Although Gamble’s attorney responded that the Court does not have to reach that question in this case, Justice Kavanaugh disagreed, stating that Gamble’s position would logically extend to Justice Alito’s hypothetical. Justices also repeatedly expressed concerns about invalidating the separate sovereigns doctrine because such an invalidation would not be in keeping with the principle of stare decisis. Justice Kagan noted that the separate sovereigns rule is 170 years old and 30 Justices have voted in favor of it. The Justice characterized stare decisis as a “doctrine of humility” and expressed doubt that the Court would be comfortable “throwing over 170-year-old rules that 30 Justices have approved just because we think we can kind of do it better.” Justice Gorsuch expressed the same concern. Justice Gorsuch elicited laughter when he asked “…of all the errors this Court has made over the years…why this one? Why should we care about this one?” Justice Gorsuch noted that the Court did not overrule the 1944 case of Korematsu v. United States, (widely regarded as one of the worst rulings in Supreme Court history), until last year. Feigen returned to the hypothetical Justice Alito had posed to his opponent and said it’s not just a hypothetical problem but “a real one.” Feigin noted that in 2003 the FARC (Revolutionary Armed Forces of Colombia) rebels in Colombia kidnapped American journalists and held them hostage for five years. The Colombian government eventually dropped charges against the rebels. Kyle Hawkins, Texas Solicitor General, argued as an amici curiae, in support of maintaining the separate sovereigns doctrine. Hawkins said he represented a coalition of 36 states that are united in urging the Court not to overrule the doctrine. Hawkins said an overruling of the separate sovereigns doctrine would force courts across the country to determine how to apply double jeopardy analysis when charges related to the same set of acts or transactions are brought under different completely different statutory schemes. Check out The Atlantic, The New York Times, and The Washington Post for more information on this case. To obtain Social Security disability benefits, an applicant must first establish that he has a disability. But he can be denied benefits if the Social Security Administration determines that there is work that he can do despite the disability. (See here for a more detailed explanation.) In Biestek v. Berryhill, argued on December 4, the applicant, Michael Biestek, was denied benefits because a vocational expert testified that there was other work that he could have done. The expert said her data was based on private data, job analyses, and personal discussions with employers. When Biestek asked for the underlying data that supported this expert’s conclusion, the expert refused and the Administrative Law Judge did not require her to hand over the data. Biestek appealed to the Sixth Circuit which affirmed. The technical issue in the case is whether the vocational expert’s testimony, in the absence of the underlying data, provides the requisite substantial evidence to deny benefits. The second case the Court heard on Tuesday was Helsinn Healthcare v. Teva Pharmaceuticals. This is an appeal from a Federal Circuit decision which invalidated Helsinn Healthcare’s patent on an anti-nausea drug called Aloxi. The issue the Supreme Court will be deciding is whether under the America Invents Act, an inventor’s licensing of an invention to a manufacturer, where neither party discloses the details of the invention to the public, qualifies as prior art which would affect the patentability of the invention. Check out IPPro and The National Law Review for more information. At oral argument Dawson claimed that he had the same law enforcement authority as state employees whose retirement benefits are tax exempt, and argued that “the State can’t justify discriminatory tax treatment just based on whether he has some additional administrative responsibilities, but his basic law enforcement function is the same.” On the other hand, respondents argue that the differences in tax exempt status arise out of differences in the particular retirement plans that the two groups belong to, pushing back against the argument that the West Virginia Code was facially discriminatory. The Telegraph reported on the arguments, suggesting that the Court appeared to be more likely to side with Dawson; Herald-Mail Media had a similar perspective on the Dawson arguments. Petitioners James and Elaine Dawson are clients of the WVU Law School’s U.S. Supreme Court Clinic. The respondent, the Securities and Exchange Commission, emphatically argued against this point, saying “And this email was extraordinarily deceptive, as was commented earlier. There were – there were three gross mischaracterizations of the company under the representation that they would provide different layers of protection.” The New York Times has some background on the case in this July 3, 2018 article, and the Epoch Times gives an overview of the case and Monday’s arguments. ISCOTUS Fellows Zoe Arthurson-McColl and Michael Halpin, both Chicago-Kent Class of 2020, contributed to this post, which was edited by Matthew Webber, ISCOTUS Editorial Coordinator, Chicago-Kent Class of 2019, and overseen by ISCOTUS Co-Director Carolyn Shapiro. What happens if police officers arrest someone because the officers don’t like the arrestee’s speech — but the officers also have probable cause. Can the arrestee sue for retaliatory arrest in violation of the First Amendment? This was the question in Nieves v. Bartlett, argued on November 26. The case began when two Alaska state troopers, Luis Nieves and Bryce Weight, arrested Russell Bartlett, an allegedly intoxicated and belligerent attendee at Arctic Man Festival. Bartlett was charged with disorderly conduct and resisting arrest. After a court dismissed the charges, he sued the officers under §1983. Bartlett complained that the arrest was retaliation for his refusal to talk to them and for his challenge to their attempt to question a teenager in the absence of the youth’s parent or guardian. The officers argue that retaliatory arrest claims should be governed by the common-law rule that probable cause protects officers from liability for enforcing the law, partially because determining causation for arrests is difficult. Principal Deputy Solicitor General Jeffrey Wall argued on behalf of the U.S., supporting the officers. Wall argued that claims of retaliatory arrest should be screened from purely subjective probes into officers’ motivations because such claims are easy to allege and expensive to defend against. The plaintiff, Bartlett, argued that the Court should reject the common-law rule for three reasons: it would bar meritorious First Amendment retaliation cases regardless of supporting evidence; the rule is unnecessary for screening out meritless cases; and the rule lacks any grounding in the common law as it existed in 1871 when Congress enacted §1983. Bartlett’s lawyer, Zane Wilson, argued that would-be-litigants frequently have trouble finding lawyers for meritless cases, and that they frequently decide not to litigate for retaliatory arrest they’ve been convicted for the crime they were arrested for. Wilson faced a hot bench when he said that arrestees who are eventually convicted would have no damages, saying that as a result, “you’ve eliminated that entire category of cases” from the hypothetical onslaught of litigation the officers warned about. Chief Justice Roberts, Justice Kavanaugh and Justice Alito simultaneously asked “Why? !” Wilson pointed to the sparseness of retaliatory arrest cases that have been cited before the Supreme Court on First Amendment grounds. Justice Kavanaugh challenged him, noting that theoretically, convicts could still bring claims, arguing that the retaliatory motive was the “but for” cause of their arrest. More in-depth analysis about the case is available from Professor Garrett Epps at The Atlantic. On this day in 1862, Justice David Davis took his oath of office. David Davis was born March 9, 1815, in Cecil County, Maryland. He moved to Illinois, where he became a state representative in 1845 and then a State Circuit Judge from 1848 to 1862. During this time he formed a friendship with Abraham Lincoln, who as a lawyer was a regular on Davis’ circuit. When Lincoln ran for the presidency in 1860, Davis was an active supporter. Lincoln repaid his loyal friend by nominating him to replace Supreme Court Justice John A. Campbell on December 1, 1862. 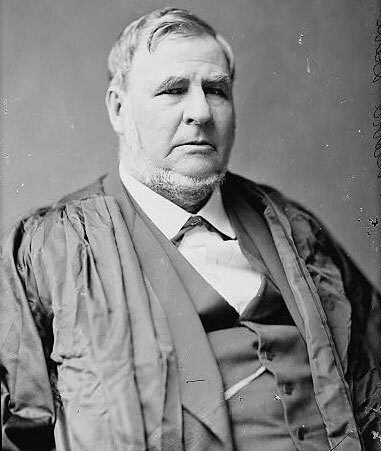 The Senate confirmed the nomination by voice vote on December 8, 1862, and two days, after taking his oath, he joined the Court. Among Davis’ most famous opinions was Ex Parte Milligan. A military commission sentenced Lambden P. Milligan to death in Indiana during the Civil War for acts of disloyalty. Milligan’s lawyers sought a writ of habeas corpus, questioning the sentence’s constitutionality. In March 1863, Lincoln had signed into law the Habeas Corpus Suspension Act, which suspended the the writ of habeas corpus in cases of rebellion or invasion that threaten the public safety. In Milligan, the Court held that presidentially created military commissions’ trials of civilians are unconstitutional unless there is no civilian court available. The military commission therefore lacked jurisdiction to try or sentence Milligan, and he was entitled to discharge. Davis’s tenure was also notable for his voting with the 5-member majority in the 1863 Prize cases. The majority held that the Lincoln administration was within its Article II rights to seize vessels bound for Confederate ports absent a declaration of war. Davis served fourteen years on the Court. He resigned on March 4, 1877, when the Illinois State Legislature elected him to the United States Senate. He served one term in the Senate, retiring in 1883. This Post Was Written by ISCOTUS Fellow Bridget Flynn, Chicago-Kent Class of 2019, edited by ISCOTUS Editorial Coordinator Matthew Webber, Chicago-Kent Class of 2019, and ISCOTUS Co-Director and Chicago-Kent Faculty Member Christopher W. Schmidt.